Check out what our Department has accomplished in 2018! Click here to view our 2018 Annual Report. The Storm Water Advisory Board of the County of Porter, Indiana, will hold a meeting on the 13th day of May 2019 at 5:00 p.m., in the Porter County Administrative Center, 155 Indiana Avenue, Suite 205, Valparaiso, IN 46383. Agenda Forthcoming. The Storm Water Management Board of the County of Porter, Indiana, will hold a special meeting on the 23rd day of April 2019 at 9:00 a.m., in the Porter County Administrative Center, 155 Indiana Avenue, Suite 205, Valparaiso, IN 46383. View Agenda. 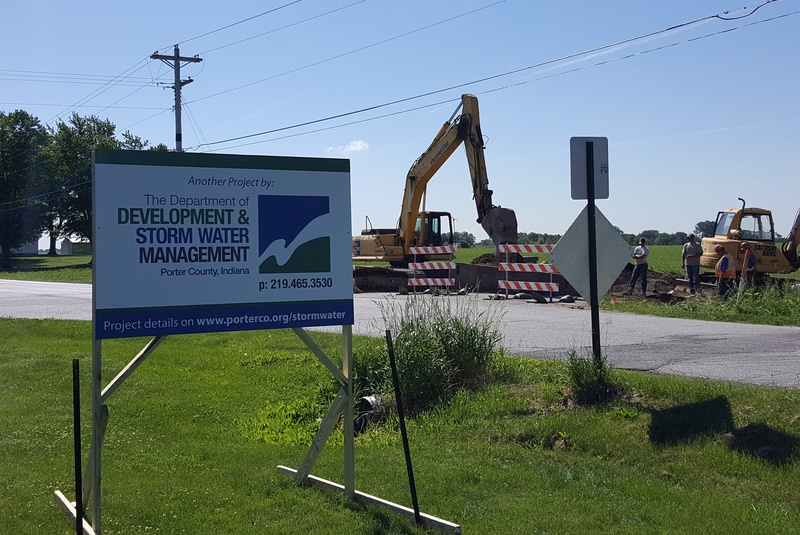 The Department of Development & Storm Water Management will receive sealed bids for this project until 9:00 a.m. local time on Tuesday, February 26, 2019, at the Office of the Auditor, Porter County Administration Center, 155 Indiana Ave., Ste 204, Valparaiso, IN 46383. Bids will be opened and read aloud on Tuesday, February 26, 2019, at a meeting of the Porter County Storm Water Management Board, to be held at 9 a.m. local time at the Porter County Administration Center, 155 Indiana Ave., Ste 205, Valparaiso, IN 46383. The Department of Development & Storm Water Management received bids for this project until 9:00 a.m. local time on Tuesday, December 11, 2018, at the Office of the Auditor, Porter County Administration Center,155 Indiana Ave., Ste. 204, Valparaiso, IN 46383. The Department of Development and Storm Water Management has withdrawn the Request for Quotes for this project. An Invitation to Bid for this project will be released in the near future. The Department of Development & Storm Water Management received bids for this project until 9:00 a.m. local time on Tuesday, October 30, 2018, at the Office of the Auditor, Porter County Administration Center,155 Indiana Ave., Ste. 204, Valparaiso, IN 46383. 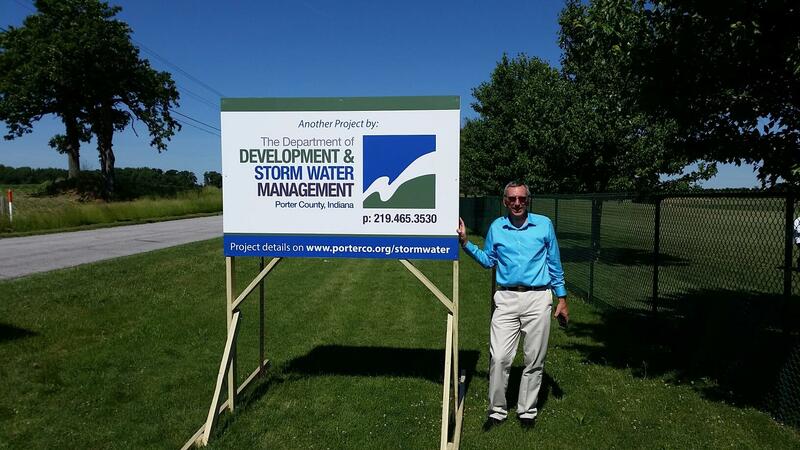 The Porter County Department of Development & Storm Water Management received bids for this project until 9 a.m. local time on Tuesday, October 2, 2018, at the issuing office located at 155 Indiana Ave., Ste 311, Valparaiso, IN 46383. As part of our efforts in greater South Haven, Porter County has undertaken an important effort to repair and reconstruct the storm water management system serving Old South Haven. Phase 1 of the effort includes 5 projects, which are proceeding through the planning and design process towards construction. At this point, planning and design work has been completed on one of the projects! The project, which has been designated as the Northeast Storm Sewer Project, will generally affect the area bound by US 6 to the north, IN 149 to the east, Midway Dr. to the south, and Imperial Rd. to the west, and it is ready to begin! The first segment of the Northeast Storm Sewer Project that will get underway is the work on Governor Rd. This segment of the project will include the installation of a new storm sewer and complete roadway reconstruction on Governor Rd. between LaHonda Dr. and Midway Dr. All of the work will generally take place within the right-of-way associated with Governor Rd., but since it will involve the installation of a new storm sewer and complete roadway reconstruction, it will also necessarily involve disturbances to, and closure of, roadways, driveway approaches, and sidewalks along the project reach. The contractor, Grimmer Construction, Inc., is scheduled to begin work on this segment during the week of November 12, 2018. The contractor will begin mobilizing and preparing for the work during the week of November 5, 2018.
, or in person onsite as the Northeast Storm Sewer Project gets underway. Thank you for your patience and understanding while we work to repair and reconstruct the storm water management system serving Old South Haven! Welcome to the Porter County Department of Development and Storm Water Management. Our Mission is to coordinate the storm water activities to improve water quality, reduce flood damages and restore and enhance the natural drainage system. End Goal: CLEAN WATER FOR EVERYONE! What is Storm Water and why is Storm Water Management so important? Storm water is rain, snow, sleet or ice melt flowing over land with all debris and pollutants picked up along the way. This water flows into a system of pipes, ponds and ditches that empty directly into our creeks, lakes and rivers. These systems require maintenance to prevent pollution and improve water quality. Storm water is not treated at a treatment plant so it is up to individuals to make sure that water depositing into the environment is clean. What is the "Storm Water" fee that has been added to my taxes? Storm water is conveyed through pipes, ponds and ditches that require maintenance to prevent pollution and improve water quality. Action was taken in order to comply with federal mandate from the Environmental Protection Agency (EPA) and the Indiana Department of Environmental Management (IDEM). IDEM designated Porter County as an MS4 entity which requires the county to comply with standards for clean water. How is the fee used? 1. Implement a public education program to distribute materials and conduct activities to inform the public about the impact of storm water discharges on our water bodies and the steps that can be taken to prevent storm water pollution. 2. Provide the public with an opportunity to plan an active roll in development and implementation of the program. 3. Detect and eliminate discharges to storm water conveyances that are not composed entirely of storm water. 4. Administer a permitting program that requires a storm water quality protection plan for construction activities that result in a land disturbance of equal to or greater than one acre. 5. Maintain records and inspections of storm water protection practices at completed construction sites where land disturbances were equal to or greater than one acre. 6. Reduce pollutants in storm water runoff from county facilities by utilizing storm water protection practices in the operation and maintenance of these facilities. Click here for more frequently asked questions. 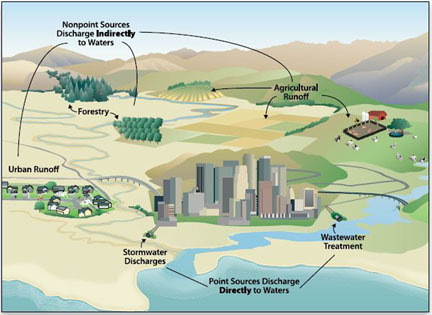 Polluted water enters lakes and rivers in two ways: point and non-point sources. Point sources are easy to identify because it comes from a pipe and can be traced back to someone accountable for the pollution they are depositing. The Clean Water Act (CWA) has special permits and has been successful in reducing pollution from point sources. Non-point sources are, by definition, harder to control because it comes from many different sources and there is no one person accountable for the collective pollution. Classic examples include water coming from parking lots and water flowing over fertilized lawns. Non-point sources, including storm water, are very significant contributors to water pollution and very difficult to regulate. It is hopeful that individual actions have the greatest impact. Storm water flowing over parking lots and roads picks up antifreeze, gasoline, and oil that dripped from cars, as well as heavy metals such as copper, chromium, lead and zinc. Road salt used to melt snow washes directly into our water systems changing the conditions for animal and plant life to survive, as well as making our drinking water salty. With increased amounts of nutrients from lawn fertilizer, pet droppings and phosphorus based soaps dumped into the water, algae thrives and increases in population creating a “bloom” that eventually decays, creating a nasty odor and decreasing the amount of available oxygen in the water. As the algae decays, the bacteria feeding on them use up oxygen. This can lead to the death of fish. Water running off pavement and roads can be very hot. A change in the temperature of the water can change the suitability for certain animals and plants to survive and reduce oxygen availability. Water flowing over construction sites and sand and grit from roadways can end up making the water in the creeks, rivers, and lakes cloudy. The sediment eventually deposits at the bottom but this makes the body of water shallower and can lead to increased temperatures and lower oxygen levels. It can also lead to the clogging of fish gills. When large amounts of water surge into creeks and other water ways it can be very destructive. Also invasive species can be transported by storm water. Human activity on the land influences the quality of our water, for better or worse, water quality is connected to our health, safety and ability to use water for recreational purposes. Storm water that is not properly managed can cause expensive damage to private and public property and degrade our water supply. Houses may flood, but also an issue that is more prevalent are roads flooding. This is a public health and safety risk. If stagnant water on the roads does not drain properly during the winter there is a greater risk for ice to form on the roads. When the water quality is too poor to support a healthy fish population or is no longer safe for contact with humans, recreational activities are negatively affected. Mosquitoes breed in stagnant water that is not well managed or in correct ecosystem. As less water infiltrates into the ground to recharge the groundwater, there is a need to dig deeper for our water supply. This process is expensive, not sustainable and increases the risk of groundwater contamination. Disease causing organisms, such as E. Coli can enter waterways through storm water. This is a major public health issue that can be prevented. Common sources are high levels of bacteria in storm water from pet waste, geese droppings and improperly treated sewage. Why was there an increase in my taxes? Why should I have to pay? I live out in the country and have no drainage problems. Doesn't the County already have funding in place for storm water issues? Do residents of Valparaiso, Portage or other Cities & Towns within Porter County have to pay the county storm water fee? What is Storm Water runoff? What problems can runoff cause? Who oversees Storm Water Operations? Are sanitary sewers and storm drains the same thing? What is the clean water program?